LOS ANGELES—Notre Dame’s offensive skill players gathered on the sideline and looked up at an unfamiliar sight on the scoreboard. The Fighting Irish hadn’t faced a double-digit deficit at any point in their perfect season before Southern California jumped to a 10-0 lead Saturday night.With their national championship dreams suddenly in a wee bit of trouble, running back Dexter Williams spoke up. ”Somebody has got to make a play!” Williams shouted. Ian Book and Chris Finke did just that on Notre Dame’s next drive, and Williams did it himself right after halftime.By the time the Irish were done making plays at the Coliseum, they were well on the way to the College Football Playoff with the Jeweled Shillelagh firmly in hand.Book passed for 352 yards, Williams went 52 yards on a go-ahead touchdown run and No. 3 Notre Dame completed an unbeaten regular season and likely secured a playoff spot with a 24-17 over longtime rival USC. Finke made an exceptional TD catch for the first score by the Fighting Irish (12-0, No. 3 CFP), who showed playoff-level tenacity in rallying from their largest deficit of the season. Tony Jones Jr. then took a short pass 51 yards for a touchdown with 3:09 to play to finish off Notre Dame’s 10th perfect regular season since 1945, the first since 2012. Williams rushed for 97 yards as the Irish overcame a slow start in the 90th edition in this famed intersectional rivalry. Notre Dame didn’t score until Finke’s TD catch shortly before halftime, but the Irish ran off 24 consecutive points and shut out USC in the second half until Tyler Vaughns’ TD catch with 48 seconds to play.ND is all but certain to be chosen for the four-team playoff, and this win could keep the Irish away from powerhouse Alabama in the first postseason game. The Irish celebrated with ferocity in the Coliseum locker room, with their shouts echoing through the old walls into the USC room. J.T. Daniels passed for 349 yards for the Trojans (5-7), who will stay home for the bowl season after their first losing season since 2000. Vaughns caught 12 passes for 120 yards in what might have been the final game for coach Clay Helton, who is under pressure after the Trojans lost five of their final six games in a dismaying collapse.USC athletic director Lynn Swann didn’t make an immediate announcement on Helton’s future. After USC won eight straight over Notre Dame in the 2000s, the Irish have won six of the last nine meetings in this classic college football matchup. Notre Dame is the first road team to win in the series since 2012, when the Irish also completed an unbeaten regular season with a victory at the Coliseum.Only four USC teams have finished with losing records since 1961, but this clearly talented group gave a tough game to the powerhouse Irish. The Trojans’ 289 yards in the first half were 64 more than the Irish had allowed before halftime all season, and Notre Dame had only trailed twice at any point all season.Although Jones’ late rumble to the end zone clinched the expected result for Notre Dame, the Trojans were competitive with an elite opponent despite the roiling subplot of their coach’s future.USC’s 10-7 halftime lead could have been much larger, but receivers Michael Pittman Jr. and Amon-Ra St. Brown both fumbled after catches in Notre Dame territory. The Irish offense didn’t score until 2:20 before halftime on that 24-yard throw to Finke, who hadn’t caught a TD pass since the season opener against Michigan. No doubt about it now, the Bears really are serious about winning the NFC North.Khalil Mack had a sack and fumble recovery, Eddie Jackson returned an interception for a touchdown and the Bears tightened their grip on the division with a 25-20 victory over the second-place Minnesota Vikings on Sunday night.Mack and Jackson led a dominant effort by the defense. And the Bears (7-3) took a big step toward its first division championship since 2010.The Bears won their fourth in a row, their longest streak since a six-game run in 2012. The Bears finished 10-6 that year, missed the playoffs and fired coach Lovie Smith after that season. The Monsters of the Midway simply dominated Minnesota on Sunday, taking out the defending division champions after beating three struggling teams – the New York Jets, Buffalo Bills and Detroit Lions.The Bears also have victories the past two weeks over NFC North opponents after dropping 10 in a row against division foes. The Bears suffocated the Vikings (5-4-1), with big advantages in total yards (308-268) and time of possession (34:29-25:31) even though quarterback Mitchell Trubisky had his difficulties.The Bears were leading by eight midway through the fourth quarter when Jackson picked off a pass from Kirk Cousins that was intended for Laquon Treadwell. His 27-yard TD return and a 2-point conversion pass from Trubisky to Adam Shaheen made it 22-6.Cousins then threw a 13-yard TD to Aldrick Robsinon and a 2-point conversion to Adam Thielen, making it 22-14. But Cody Parkey kicked to 48-yard field goal with 2:48 left. And the Bears hung on from there.Trubisky was 20 of 31 for 165 yards and a touchdown. But he was intercepted two times by Anthony Harris.Parkey shook off a performance unlike any other by making all three of his field goal attempts. It was a big improvement over the previous week, when he hit uprights four times while missing two field goals and two extra points against Detroit. Cousins was consistently under pressure and finished 30 of 46 for 262 yards. He threw two touchdowns in the final 4:51 and got intercepted two times.Stefon Diggs had 13 catches for 126 yards and a TD. But the Vikings came up short after winning four of five.Parkey nailed a 33-yard field goal down the middle on Bears first possession, drawing a loud and maybe sarcastic roar from the crowd. It was a promising start for a kicker lampooned by Jimmy Fallon on ”The Tonight Show.” Chicago TV stations even sent helicopters to shoot footage when he practiced at Soldier Field on Wednesday night.Mack gave the crowd more to cheer near the end of the first quarter when he jarred the ball from Dalvin Cook and recovered at the Bears 15, stopping a scoring threat.The Bears added to their lead midway through the second when a sliding Anthony Miller hauled in an 18-yard touchdown from Trubisky. That capped the league’s longest touchdown drive this season in terms of plays (13) and time (7:13).Trubisky then hit Josh Bellamy in the end zone to make it 11-0, after the Bears opted to go for two rather than have Parky attempt an extra point.Parkey nailed a 41-yarder with room to spare in the closing minute of the half to make it a 14-point game. The Vikings then drove to the Chicago 32. But with Leonard Floyd bearing down on him, Cousins unleashed a wobbly heave that Adrian Amos picked off with on one else near him.The Bears and Vikings face off again on Dec. 30 at Minnesota. Cats roll on with 24-14 win over Gophers. MINNEAPOLIS—When he was an assistant at Northern Illinois, Minnesota coach P.J. Fleck once cold-called Pat Fitzgerald for a lunch meeting to learn about being a head coach.A decade later, Fitzgerald and his Northwestern Wildcats are still teaching teams like the Gophers how to win in the Big Ten.Isaiah Bowser rushed for 85 yards and two touchdowns, and No. 24 Northwestern turned three turnovers by Minnesota quarterback Tanner Morgan into 10 points on the way to a 24-14 victory on Saturday that stretched its program-record road winning streak to eight games. Clayton Thorson completed 15 of 21 passes for 230 yards without a turnover and had a 13-yard touchdown run in the first half for the Wildcats (7-4, 7-1, No. 22 CFP), who have their best Big Ten record since 1996 when Fitzgerald was in his final season as a player.Nate Hall had two interceptions for the Wildcats, who have won 14 of their last 15 conference contests, including 11 games in a row against opponents within the West Division they clinched the week before. Hall, who also made the tackle on a fourth-and-1 stop of Seth Green at the Northwestern 26 in the second quarter, was ejected for targeting on a helmet-to-helmet hit on Morgan in the fourth quarter. With a kickoff temperature of 23 degrees, which was actually slightly warmer than when Minnesota beat Purdue here last week , Thorson and the Wildcats played the field-position game well. The secondary missing three injured starters complemented a strong pass rush led by Joe Gaziano, who forced a fumble by Morgan with a sack in the fourth quarter, setting up a short field goal.That came right after a 68-yard completion on third down from Thorson to J.J. Jefferson, who slipped past freshman safety Jordan Howden and was tackled at the 2 before Bowser’s second score.Morgan finished 19 for 32 for 197 yards and a late touchdown pass to Tyler Johnson, who topped the 1,000-yard mark for the season. Minnesota’s streak of four straight games with 400-plus total yards, the longest for the program in more than 12 years, was stopped. After cracking The Associated Press Top 25 for the first time this season following last week’s win at Iowa , Northwestern will remain a ranked team for now. The Wildcats aren’t part of the College Football Playoff conversation, but to be headed for the Big Ten championship game in December after losing at home to Akron and starting the season 1-3 in September is quite an accomplishment. The Cats host Illinois as they try to defend the Land if Lincoln Trophy next Saturday. ROUT!!!! Iowa blows away Illini 63-0. CHAMPAIGN—Nate Stanley passed for 178 yards and three touchdowns while Mekhi Sargent and Toren Young added two rushing touchdowns each as Iowa rolled over Illinois 63-0 on Saturday.It tied the largest margin of defeat in Illinois history, matching a 63-0 loss to the University of Chicago in 1906.The win ended a three-game skid for the Hawkeyes (7-4, 4-4 Big Ten) and makes a bowl invitation all but certain.The loss ended Illinois’ bowl hopes.Iowa quarterback Nate Stanley threw an interception on the second play of the game and the Hawkeyes punted on the next series. But the floodgates soon opened: Over the next 18 minutes, Iowa scored five times. The Hawkeyes led 35-0 at the half. Stanley was 13 of 21 through the air for three touchdowns and one interception. His touchdown passes went to tight end Noah Fant (who played sparingly last week much to the chagrin of many Iowa fans) and T.J. Hockenson.Sargent carried 17 times for 121 yards, while Young rushed for 67 yards on 14 carries. Kyle Groeneweg returned a punt for a touchdown following Illinois’s first series of the second half.AJ Bush was 12 of 28 for 82 yards and two interceptions for Illinois. Ra’Von Bonner carried the ball 21 times for 111 yards.Illinois’ top rusher. Reggie Corbin, left last week’s game with an ankle injury and appeared to re-injure it in the first half. He carried the ball once prior to leaving Saturday’s for minus 4 yards.Illinois (4-7, 2-6) turned the ball over four times, which led owa points.The Illini face Big Ten Northwestern next Saturday in Evanston in their season finale. NEW YORK—The band was an Aaron Judge moon shot away from the field, way up in the right-field bleachers of Yankee Stadium.Still, the Fighting Irish lined up in the end zone/outfield and sang the alma mater – just as they would have at Notre Dame Stadium – after dispatching No. 12 Syracuse and putting themselves a step away from the College Football Playoff.Ian Book returned to the starting lineup for No. 3 Notre Dame and threw for 292 yards and two touchdowns as the Fighting Irish routed the Orange 36-3 on Saturday to stay unbeaten.The Irish will head West next week to face struggling rival Southern California, with a spot in the playoff in their grasp. Notre Dame held out Book from last week’s home game against Florida State with a rib injury. He wasn’t missed as the Irish (11-0, No. 3 CFP) rolled with Brandon Wimbush at quarterback.They clearly wanted to be cautious with Book ahead of their trip to the Bronx to face high-scoring Syracuse (8-3, No. 12 CFP), averaging 44 points per game. Book, the junior quarterback who took over as the starter four games into the season, looked good as new. Donning pinstripe uniforms in a tribute to the usual residents of the ballpark, Notre Dame went up 7-0 on its second possession on a 9-yard pass from Book to Dexter Williams.The Subway Alumni, along with the bridge and tunnel crowd, packed Yankee Stadium on a 45-degree day in the Bronx. The sellout crowd was announced at 48,104.That the Fighting Irish were playing such an important game away from South Bend, Indiana, did not sit well with most of their fans. Even Kelly said it was not ideal. Part of the Shamrock Series, the off-site ”home” games Notre Dame plays almost annually, the Irish’s second trip to the new Yankee Stadium had been in the works for several years.Adding to the anxiety of playing a Syracuse team having its best season in more than a decade was Notre Dame’s unusual stretch schedule. Notre Dame has played only one home game since mid-October and the trip to USC will be its second to the West Coast in five weeks.Turns out, there was nothing to worry about in New York. The most significant college football game at Yankee Stadium since No. 1 Army and No. 2 Notre Dame played a 0-0 tie in 1946 was no Game of the Century. The Orange played most of the game without starting quarterback Eric Dungey, who left in the first quarter with what the school said was an upper-body injury. Coach Dino Babers said they would know more about Dungey’s condition when he was examined upon return to Syracuse.Tommy DeVito, who came off the bench earlier this season to relieve Dungey against North Carolina and lead the Orange to an overtime victory, stepped in but looked overmatched. The redshirt freshman was sacked six times and picked off twice.Only a field goal with 10 seconds left denied the Irish their first shutout since Sept. 6, 2014, when they beat Michigan 31-0 in South Bend.Syracuse has played both No. 2 Clemson and Notre Dame this season, losing a close game in Death Valley. Notre Dame improved 17-6-3 all-time at Yankee Stadium, including 3-0 at the newest version since Kelly took over. Ray Clay (Bulls public address announcer, 1990-2002): My wife and I were driving to a wedding and had the Bulls game on the radio—I had to listen to the starting lineups like everybody wanted to do at that point. The broadcaster mentioned that it was Tommy Edwards’s final game. My wife said, “That’d be a neat job. Why don’t you call the Bulls and see if they’re interested in giving you an audition?” I said, “I’d never get a job like that. But I’ll call.” A guy I happened to know at the Bulls said, “Send in a tape.” At that time, I worked as the campus recreation director at the University of Illinois at Chicago. So I sent a cassette of some UIC basketball games that I’d called, including the starting-lineup introductions. A couple days later, I got a call from the Bulls: “What are you doing Friday? We’d like you to call the game.” That was my audition. I was very nervous, having never announced a professional game before. I got to Chicago Stadium early and looked at the script book, which laid out the game with which activities were going to happen during the timeouts, announcements, pregame, during game, halftime, postgame. The Bulls rep said to me, “We’re gonna do the starting lineups. When the lights go out and the music starts, I’ll cue you when to go.” I said, “Yeah, but wait—the lights go out.” I had everything written down on a sheet of paper! This made me even more nervous. So the lights went out, the music started, the guy gave me a nudge and said, “Go.” I blurted out, “Aaaand now, the starting lineup for your Chicago Bulls!” The Bulls were touting Chicago Stadium as the noisiest arena in the NBA at that time, so I figured that I needed to give a good yell. That’s how my high-volume signature started. Brenner: Ray Clay—great voice, great person, but he didn’t have the broadcast experience that Tommy did, where you could just throw him in front of a microphone and he could nail it. He had a lot to learn. Bears take advantage of Lions goofs for 34-22 romp. Mitchell Trubisky threw for 355 yards and three touchdowns, and the NFC North-leading Bears beat the Detroit Lions 34-22 to snap a 10-game losing streak against division opponents on Sunday.The Bears (6-3) had dropped nine of 10 against Detroit (3-6) and were seeking their first victory over a division opponent since Oct. 31, 2016, against Minnesota.The Home team jumped out to a 26-7 halftime lead with Trubisky and Allen Robinson leading the way. 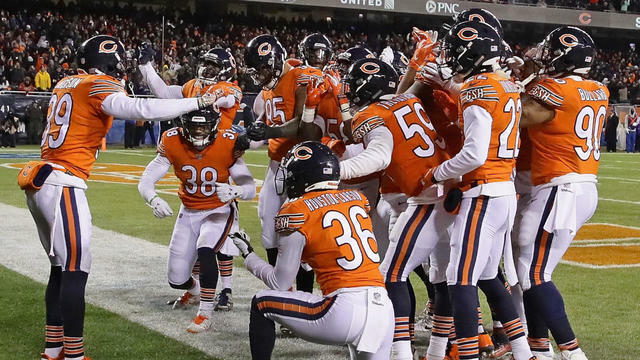 And the Bears surpassed their win total from last year with their third straight victory.Trubisky completed 23 of 30 passes against a short-handed secondary, with standout cornerback Darius Slay sidelined by a knee injury.Allen Robinson caught six passes for 133 yards and two TDs after missing two games with a groin injury.Rookie Anthony Miller added a career high 122 yards on five receptions, including a 45-yard TD and a 55-yard catch.Khalil Mack had two of the Bears six sacks against Matthew Stafford – both in the second half after missing back-to-back games with an injured right ankle.Bryce Callahan had a sack and an interception.About the only downer for the Bears was Cody Parkey missing two extra points and two field goals. Things were so bad for him that fans cheered sarcastically when he made an extra point late in the first half and let out a loud roar when the Bears went for a 2-point conversion after a touchdown by Robinson in the third.But Parkey’s misses didn’t stop the Bears from opening a three-game stretch against division opponents on a winning note.Detroit dropped its third in a row after back-to-back victories.Stafford was consistently under pressure again after getting sacked 10 times against Minnesota the previous week. He was 25 of 42 for 274 yards, two touchdowns and a pair of interceptions.Coming off a 41-9 romp at Buffalo, the Bears immediately took control by scoring on its first four possessions.The Bears went 75 yards on the game’s opening drive, with Tarik Cohen running it in from the 3 after Robinson broke a tackle by DeShawn Shead on a 35-yard slant. Parkey hit the right upright on the extra-point attempt.Robinson also had Shead on him when he hauled in a 36-yard pass in the end zone on third-and-15 in the closing minute of the first quarter.The Bears added to their lead early in the second quarter on a 45-yard touchdown pass to Miller, who wriggled free when Glover Quin tried to tackle him at about the 20. Parkey missed another extra point, this time off the left upright.Callahan then intercepted Stafford at the Detroit 30 and got pushed out at the 18. That led to a 4-yard touchdown by Trubisky on a draw, making it 26-0.Detroit scored with just over a minute left in the half when Kerryon Johnson went over the top for a touchdown. SOUTH BEND—Just what third-ranked Notre Dame doesn’t need going into its final two regular-season games: A quarterback controversy created by its coach. ”We want a full-blow controversy, front-page news,” Brian Kelly said with tongue firmly planted in cheek after watching senior backup Brandon Wimbush’s three-touchdown performance in a 42-13 victory over Florida State on Senior Night in frosty Notre Dame Stadium. Wimbush, who led the Irish to their first three victories, got the start in place of injured junior Ian Book, who suffered a rib injury last week against Northwestern and is expected to be cleared to play next Saturday at Yankee Stadium when the Irish (10-0, No. 3 CFP) play No. 13 Syracuse.Wimbush finished 12 of 25 for 130 yards with the scoring passes to fellow seniors – a 3-yarder to wide receiver Miles Boykin and 6- and 15-yard tosses to tight end Alize Mack. Fellow senior Dexter Williams ran for a career-high 202 yards and Notre Dame’s defense came up with two first-quarter turnovers by the Seminoles (4-6).Kelly admitted it would be tough not to go back to Book, who leads the nation in completion percentage (74.5) and is sixth in passing efficiency (170.0) while passing for 1,811 and 14 touchdowns since taking over in week four. ”When the doctor says he’s cleared to go,” Kelly said after being asked when Book would reclaim his starting role. But he didn’t want to diminish Wimbush’s performance. With the temperature at 27 degrees – the third-coldest game at Notre Dame Stadium since the 1980 season – the Irish wore green jerseys for the fourth time in Kelly’s nine-year tenure at Notre Dame to honor their seniors.Williams, who sat out the first four games of his senior season because of a university-imposed suspension, piled up the 202 yards on 20 carries, including TD runs of 58 and 32 yards, as Notre Dame outgained Florida State, 495-322, including 365 on the ground. ”The offensive line came out with the fight,” Williams said. ”I told them to keep pushing and I’m going to do what I have to do. I just told them to givSOUTH BEND—Just what third-ranked Notre Dame doesn’t need going into its final two regular-season games: A quarterback controversy created by its coach. Wimbush, however, did throw a pair of second-half interceptions that allowed coach Willie Taggart’s Seminoles (4-6) to stay around after the Irish had taken a 32-6 halftime lead. Cam Akers had two touchdown runs for Florida State, his second on a 7-yard run following Stanford Samuels’ interception early in the third quarter.But Notre Dame’s defense denied points after Dontavious Jackson’s third-quarter theft when senior Drue Tranquill and junior Khalid Kareem made stops after the Seminoles had reached the Irish 1. On fourth down, quarterback Deondre Francois (23-47, 216 yards) threw incomplete.The Seminoles, who practiced in summer-like conditions in Tallahassee before flying into wintry South Bend, saw Francois’ second pass of the game intercepted by senior Nick Coleman and Akers’ fumble recovered by junior Daelin Hayes. The Irish converted them into 10 points while taking a 17-0 first-quarter lead. IOWA CITY—Isaiah Bowser ran for 165 yards and a touchdown and Northwestern upset Iowa 14-10 on Saturday to clinch a spot in the Big Ten Championship.The Wildcats (6-4, 6-1) will now await their opponent for the league title game in Indianapolis next month.Bennett Skowronek’s 32-yard touchdown in the fourth quarter gave the Wildcats a 14-10 lead.After a first half that yielded just three total points on a field goal from Iowa kicker Miguel Recinos, the scoring ramped up in the second.Bowser hit a hole for a 34-yard touchdown to give the Wildcats their first lead of the game.After Recinos missed a field goal to respond, Iowa safety Jake Gervase intercepted Clayton Thorson’s pass off a tip.Iowa cashed in just two plays later with Nate Stanley’s 28-yard touchdown pass to Ihmir Smith-Marsette.The Hawkeyes had a chance to tie the game late in the fourth, but NU’s Cameron Ruiz forced Mekhi Sargent to fumble, and the Wildcats jumped on it.Iowa had one final chance with under two minutes to go, but another fumble by Ivory Kelly-Martin ended the Hawkeyes’ chances.Stanley threw for 269 yards and a touchdown for Iowa (6-4, 3-4), losers of three straight.Folks might chide the Big Ten for having a four or even five-loss team represent the league in its championship game. But the fact of the matter is that the Wildcats are 6-1 in the conference for the first time since 1996, when they won nine games and played in the Citrus Bowl.What a disastrous turn of events in Iowa City. Three weeks ago, fans were wondering if this was one of the most talented teams coach Kirk Ferentz has ever had. Now they’re simply hoping to finish above .500 in the Big Ten.Next, Northwestern faces Minnesota in Minneapolis. LINCOLN—Nebraska’s high-powered offense made Illinois pay for its many mistakes Saturday.The Cornhuskers converted four of the Illini’s five turnovers into 24 points while pulling away for a 54-35 win, their third in four games after an 0-6 start.The Huskers (3-7, 2-5 Big Ten) did plenty right. Wearing alternate uniforms to mark the 100th anniversary of the end of World War I, the Huskers rolled up 606 total yards on a raw afternoon when the wind chill dipped to 13 degrees. Illinois amassed 509 yards in the meeting of the Big Ten’s worst defenses. Adrian Martinez threw for 290 yards and accounted for four touchdowns and Devine Ozigbo ran for 162 yards and three scores.Illinois (4-6, 2-5) had three turnovers in the first half – two muffed punts and a fumble by quarterback AJ Bush. Those led to 17 points for Nebraska, which led 38-21 at half.Bush moved the Illini into Nebraska territory on the opening series of the second half but was intercepted when his pass went through Dominic Stampley’s hands into safety Aaron Williams’. The Huskers embarked on a 17-play, 82-yard drive that chewed nearly 8 minutes off the clock, with Ozigbo scoring his second touchdown for a 24-point lead. Martinez was 24 of 34 and threw for three touchdowns, and he ran 13 times for 55 yards and a TD. His 345 yards of total offense pushed his season total to a school freshman-record 2,747.Ozigbo broke a career-long 66-yard touchdown run in the second quarter and went 60 yards for another TD in the fourth.Bush, playing against the school where he spent the first two years of his college career, threw for 126 yards but was intercepted twice. Nebraska couldn’t stop Bush as a runner, though. He rushed for a school quarterback-record 187 yards and three touchdowns on 25 carries. Five turnovers can’t be overcome when the defense has no answer for an offense that’s rolling like Nebraska’s. It was the second straight week the Illini have had three or more turnovers and third time in four games.Ozigbo is 42 yards short of becoming the Huskers’ first 1,000-yard rusher since 2014. … Stanley Morgan Jr. caught eight passes for 131 yards and two TDs and moved to No. 2 on the school’s all-time receiving list behind Kenny Bell. … Illinois’ 383 rushing yards were its second-most this season behind the 430 against Minnesota last week…..The Illini’s Reggie Corbin, who ran for a career-high 213 yards against Minnesota, left with an injury in the middle of the second quarter. He ran nine times for 59 yards and caught one pass for 34 yards. He favored his right leg as he was helped off.